Scientists from Nanyang Technological University, Singapore (NTU Singapore) have developed a new kit that will allow doctors to find out within minutes if diabetic patients are suffering from inflammation. NTU Prof Bernhard Boehm and Dr Hou Han Wei holding their quick test kit for inflammation in diabetic patients. Current procedures require patients to wait for several hours for the results obtained from the conventional full blood count test. Also, instead of a vial of blood in the present method, the new test kit only needs a drop of blood to test if a patient is suffering from inflammation caused by abnormal immune cell activation. In conventional procedures, blood cells need to be physically separated for analysing, which is time consuming and laborious, while the new test kit does this automatically. This made-in-Singapore test kit may also see the cost of such tests becoming more affordable as it costs less than a dollar to produce. Diabetes is a serious health problem which affects about 10 per cent of the world’s population. Singapore has the second-highest proportion of diabetics among developed nations at 10.53 per cent, as estimated by International Diabetes Federation (IDF) in 2015. Type 2 diabetes is the most common and is usually treated with lifestyle changes, medication and insulin. If diabetic patients can be grouped based on their inflammation status in addition to glucose level, then doctors can better choose the treatment best suited for their patients. Dr Hou Han Wei, a senior research fellow from NTU’s Lee Kong Chian School of Medicine invented the new chip that forms the key component of the test kit. “By designing very tiny channels on our chip, we are able to physically separate the various blood cells by size into the different outlets, like a coin-sorting machine,” explained Dr Hou. White blood cells form a significant part of our body’s immune system and a key type known as neutrophils, is the first line of defence whenever infection or inflammation strikes. “Analysing these separated neutrophils could help indicate how bad an inflammation is and if there is an increased risk of infection for diabetic patients,” said Dr Hou. Dr Hou’s new chip and research findings were published earlier this year in Scientific Reports, a peer-reviewed scientific journal under the Nature Publishing Group. “Hopefully in future, clinicians can accurately tailor the right combination of drugs and thus offer a more targeted treatment approach for all diabetic patients,” added Dr Hou, the recipient of the inaugural Postdoctoral Fellowship offered by the medical school in 2014. The NTU team discovered that neutrophils can be used as a biomarker to determine if diabetic patients are suffering from an inflammation. Using the new test kit, neutrophils can be easily extracted from a blood sample, and their behaviour and function observed for more efficient inflammation profiling in additional to the cell count. In healthy individuals, neutrophils float free in the blood stream. When there is an acute inflammation such as during a bacterial or viral infection, they will slow down and roll along the vessel walls. Once near the site of infection, they squeeze through the vessel walls and move to the site of the injury. In diabetic patients, the neutrophils roll faster, which means that fewer of them will manage to squeeze through the vessel wall to tackle the infection. The increased rolling speeds of neutrophils correlate closely with cholesterol and c-reactive protein levels (a biomarker for inflammation) so it provides doctors with a better indicator of an individual’s immune status, Dr Hou explained. The NTU team found that existing drugs prescribed to treat diabetes are able to change the rolling speed of neutrophils, in addition to controlling the blood sugar level. Professor Bernhard Boehm, Scientific Director of the Metabolic Disease Research Programme at the NTU medical school, added that some drugs like Metformin and Pravastatin mitigate cardiovascular risks such as atherosclerosis, the build-up of fatty deposits in arteries which could lead to heart attacks in diabetic patients. “In doing so, these drugs may improve neutrophil function, as neutrophils are a key driver in atherosclerosis. But further research will have to be done to find out the precise interaction and extent of any beneficial effect of these drugs may have on neutrophils,” Prof Boehm added. Having more data from biomarkers such as the function and the rolling speed of neutrophils will allow doctors to better determine the state-of-health of a patient. 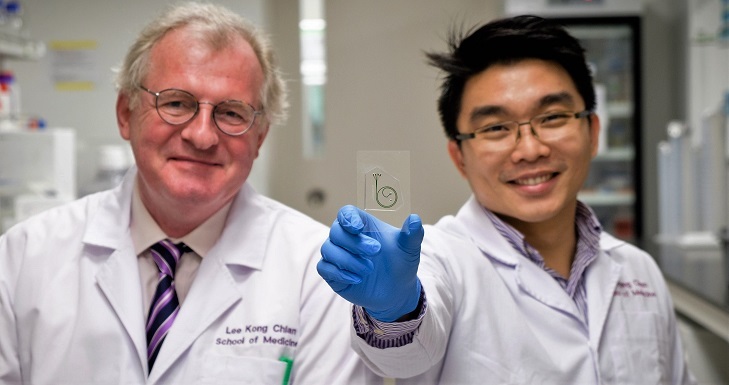 This innovative chip was a multi-disciplinary effort, developed from medical inputs from Prof Boehm and engineering inputs from Asst Prof Holden Li from NTU’s School of Mechanical and Aerospace Engineering. Dr Hou worked closely with Asst Prof Li on the fabrication of the chip and to gather data on the rolling speed of neutrophils. Moving forward, Dr Hou plans to team up with clinician-scientists at the medical school as well as at Tan Tock Seng Hospital to conduct a bigger study of the device’s use when treating patients and the impact of tailoring treatment based on the rolling speed of neutrophils.